Download the Trest App now and explore salons vetted by people in your social network. 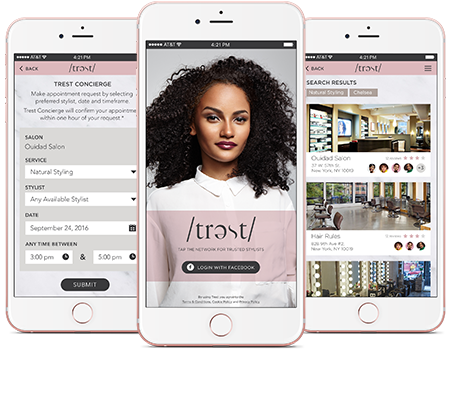 Trest is a mobile app that helps women with textured hair find stylists they can trust based on the recommendations of friends in their social networks. Sign up for our email list and be the first to know about updates and special offers. Whether you’re traveling the world, moving to a new city, or looking for someone new to make the cut— an incredible salon could be around the corner. No more awkward conversations about how to wash your hair. No more leaving the salon chair with a sigh. No more damage to your locks and your good looks. The hidden (and not so hidden) stylists are all unraveled here— vetted and rated by the people who you know have the best tressed game.